On this episode of the Secular Student Life podcast, Ryan Bell speaks with Monica Miller, about the Peace Cross in Bladensburg, Maryland—a war memorial that stands 40 feet tall in the middle of a busy intersection. Monica is Senior Counsel at the American Humanist Association. Since joining the AHA in 2012, she has vigorously defended the constitutional mandate of separation of church and state by litigating Establishment Clause cases across the country. She has served as lead counsel in over 25 federal cases, including before the U.S. Supreme Court, and the U.S. Courts of Appeals for the Fourth, Fifth, Ninth, Tenth, and Eleventh Circuits. Just over a month ago Monica presented oral arguments on behalf of the American Humanist Association before the U.S. Supreme Court in the case of regarding the constitutionality of the Bladensburg Cross war memorial in Bladensburg, Maryland. In part two, Ryan speaks with Sarah Henry, a spokesperson for the American Humanist Association, about her appearance on The Ingraham Angle, with Laura Ingraham. We break down her interview and talk about how she stayed on message and challenged the false narrative that Ingraham was spinning. Sarah is the Communications Associate at the American Humanist Association. Sarah graduated with a B.A. in Political Science and Photography from Lynn University, in sunny South Florida. She is currently a graduate student at American University, pursuing a Masters of Public Administration. Both Monica and Sarah were SSA student leaders in their respective schools and have gone on to important roles in the secular movement. #HonorThemAll - the American Humanist Association's guide to everything regarding the Bladensburg Cross case. Make a donation to support secular students today! On this episode of the Secular Student Life podcast, Ryan Bell speaks with Alana Carter, a student at Nazareth College in Rochester, New York, about her deconversion experience and subsequent experience of loss. In the space of just a year or so, Alana lost her dad, her grandmother, her aunt, and then her cat. Some of these losses happened while she was studying abroad. Alana speaks with impressive wisdom and shares how she has faced grief as a secular person. Then Ryan speaks with Garrett Price, a licensed professional counselor working in hospice in the state of Idaho. Day in and day out, Garrett works with those who are dying and the survivors they leave behind. His insights about grieving and mourning are deeply insightful. Write to us at podcast@secularstudents.org to tell us what you think of this episode, make a suggestion for a future episode, or to speak to us about your own needs for support at a secular student. We provide all of our resources free of charge to students. If you’d like to help us meet the needs of the growing secular student population, you can learn more at secularstudents.org/donate. 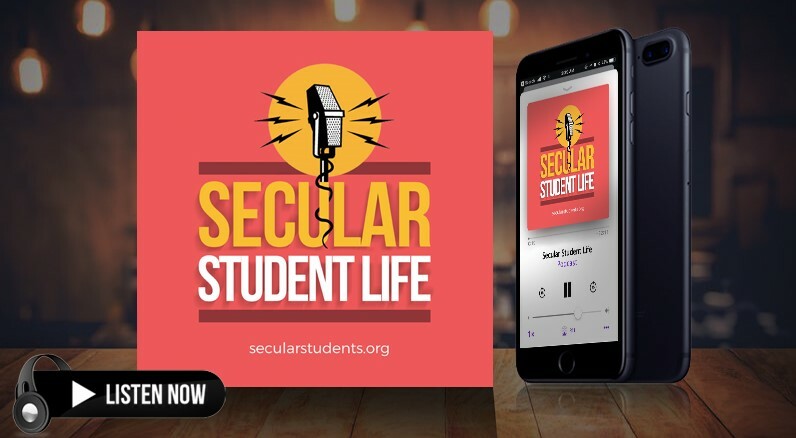 On this episode of Secular Student Life, Ryan Bell speaks with Lisa Daugherty, a student at Ivy Tech Community College in Evansville, Indiana. Lisa has worked tirelessly to get her chapter started and running smoothly in the past year, in the face of steady opposition, but there are signs that the ice is breaking and even some Christians on campus have become allies. Lisa also shares from her personal life about her upbringing in the church and how she became an atheist later in life. Darwin Day is on February 12. Resources for holding a successful Darwin Day event can be found on our website. Prepare now to be a part of SSA environmental action campaign this spring—#OneLifeOneWorld. Start by hosting a viewing of the Sunrise Movement's livestream. More information is available here. Join or start an SSA chapter on your campus! Support the Secular Student Alliance by becoming a member today!